The jazz-electronica group Koplant No emerged several years ago at the University of Iowa. When an emerging jazz band seeks to make a fresh statement, it shouldn’t surprise anyone that its musicians would embrace the modern sounds they grew up with. That explains the path of Koplant No, a quartet that fuses intricate jazz composition with improvisation, electronica and elements of hip-hop to capture a listener’s imagination. The Midwestern group, which this weekend returns to Jazz at the Bistro in St. Louis, has a light and airy sound that can sound a bit like a futuristic movie soundtrack. For a while, even its members didn’t know how to precisely describe what they play, saxophone player Joel Vanderheyden said. But they've agreed on a description, perhaps after learning that some listeners feel that hearing the music is like taking a journey. “Only in probably the last couple of years we sort of stumbled upon the label of cinematic electro jazz,” he said. 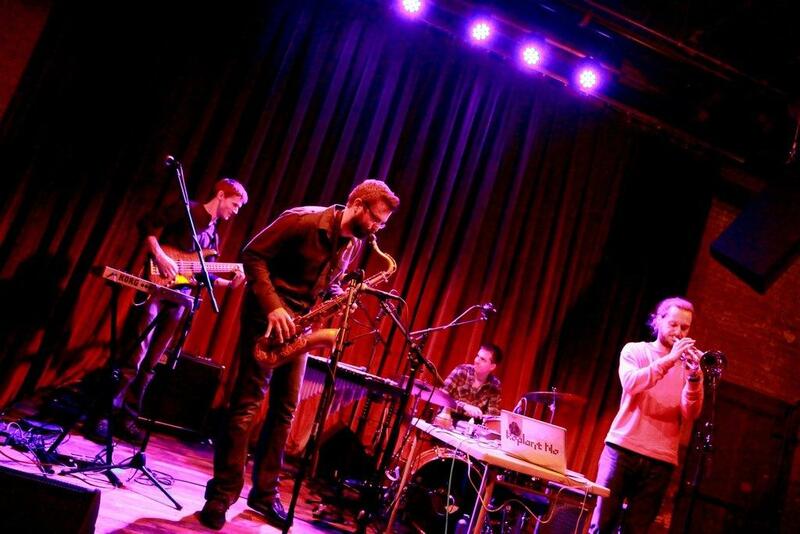 St. Louis saxophonist Joel Vanderheyden, a member of the jazz-electronica quartet Koplant No, talks to David Cazares about the band's music. Koplant No has been fusing genres since 2008, when Vanderheyden began experimenting with three other graduate students at the University of Iowa. He was joined by trumpeter Brian Lewis Smith, bassist Drew Morton and drummer Rob Baner. What brought them together was a love of classic jazz and alternative influences that they found in each other’s music collections. Vanderheyden’s big influences included classic jazz CDs such as Miles Davis’ 58 Sessions. But he was also checking out groundbreaking contemporary projects, like Radiohead. A Minneapolis native, Vanderheyden also was heavily influenced by the modern jazz groups he heard as a teenager in the Twin Cities, among them Happy Apple, which included drummer Dave King, now of the Bad Plus. His band mates listened to electronic artists like Lapaulux, a favorite of Smith. But anyone who thinks that Koplant No’s version of electronica sounds like the pulsating and repetitive energy heard in some dance clubs would be mistaken. Koplant No’s early innovation relied on simple effect pedals for trumpet and sax, and a drum pad. But the band now incorporates a variety of electronic software and sampling equipment. “We started adding extra things to where a four-piece group can sound like a whole lot more,” said Vanderheyden, who at times plays the role of a vocalist. At Jazz at the Bistro, the band’s repertoire likely will include a number of tunes from "Distants," a 2012 release. Its relaxed music builds on the melodies Smith and Vanderheyden play on horns. The musicians rely heavily on composed music, but also draw on the tradition of spontaneous musical creation that characterizes jazz. But even though they love the storied art form they’re connected to, they don’t want to be labeled. "When you think of jazz, there’s such a broad array of different types of music,” Vanderheyden said. “What jazz means to one person is totally different than what it means for someone else. “We just bring music to the table and we share it with each other and if it feels good we go with it. And we don't worry about whether it fits into, you know, a jazz category or a rock category, or hip-hop or anything like that. It all just kind of is."